The great moderation refers to a period of economic stability characterised by low inflation, positive economic growth, and the belief that the boom and bust cycle had been overcome. In retrospect, economists look back on the great moderation in a different light because although inflation was low, there was great volatility in financial markets and asset prices. 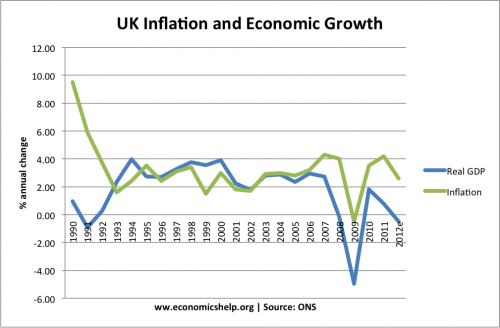 The UK great moderation from 1992 to 2008 low inflation, positive economic growth. Generally, the great moderation refers to the period 1986 – 2006. In the UK, the great moderation is considered to be the period 1993-2007 because the UK had a classic boom and bust in late 1980s and early 1990s. The UK experienced 63 consecutive quarters of economic growth between the end of the 1991 recession and the recession in 2008 – the longest continued expansion on record. This was typical of wage growth during the great moderation. 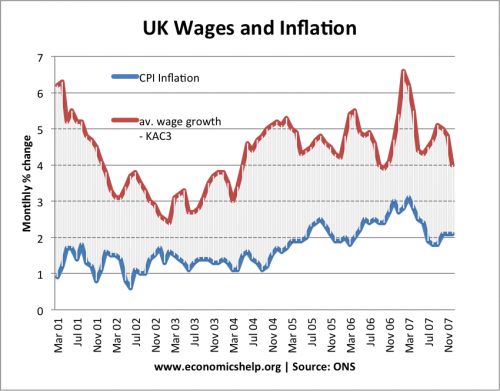 Average wage growth above CPI inflation causing a steady growth in living standards. In the post war period there seemed to be a fairly consistent business cycle. Economies would experience, high growth (a boom), but with high growth came inflation. After a period of inflation, the economy would slow down and sometimes go into recession (see boom and bust). It appeared the business cycle was volatile and inflation difficult to bring under permanent control. The 1970s, saw even greater volatility with oil shocks causing high inflation. After the volatility of the 1970s and 1980s, the great moderation was seen as a welcome end to this volatile growth and inflation. The great moderation had various aspects. Low inflation. The most prominent feature of the great moderation was persistently low inflation. It appeared that Central Banks could keep inflation low – without compromising unemployment or economic growth. The Phillips curve had either shifted to the left or was no longer relevant. There was a certain excitement that we were seeing the end of boom and bust. Stable growth. With low inflation, we avoided the boom and bust cycles. 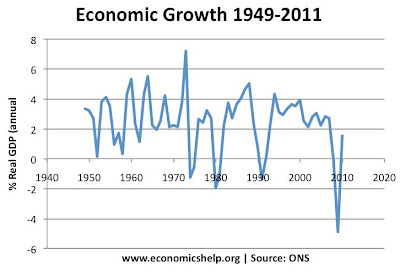 The UK had their longest period of economic expansion on record 1992-2007. Apart from a minor dip in 2001, the US economy grew strongly during 1986-2006. Rising asset prices. Asset prices, especially houses, saw a rapid growth in prices. House prices rose because of low interest rates, a stable macro-economy, and growth of mortgage lending. House prices rose faster than inflation, and even faster than incomes. Some were worried house prices were becoming overvalued, but others felt house prices weren’t overvalued because of either limited supply or the growth of new mortgages meant more people could now afford to get a mortgage. Loose Monetary Policy As well as targeting inflation, Central Banks were keen to promote economic growth. The low global inflation meant that inflation could be kept on target, even if real interest rates were relatively low. For example, after the 2001 mini recession, the Federal Reserve cut interest rates and maintained low interest rates through the early 2000s. This helped increase the rate of economic growth. According to the Taylor rule, the US were keeping interest rates lower than they should, but this was encouraged by the benign inflation rate. At the same time, in the US there was a substantial cut in income tax which helped to promote consumer spending. Falling global prices. During the 1990s, the global economy benefitted from the falling price of energy, commodities and manufactured goods. Productivity growth in China enabled the price of manufactured goods to stay low, benefiting Western consumers who saw lower prices. Many commodity prices were also stable. New gas and oil fields helped to reduce energy price inflation. Improved infrastructure. During this period, there were improvements in transport and stock control which helped keep inflation low. New technology. Some ascribe the growth of new technology, such as the internet and better computers to helping keep prices low. Confidence in Banking sector. 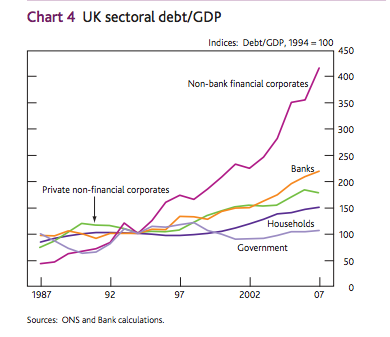 In the UK, the financial sector was an important contributor to economic growth. The growth in lending helped provide funds for investment and the success of the financial sector helped boost consumer spending. The widespread confidence helped to maintain the growth in asset prices, when a more cautious view may have seen them as overvalued. House price boom. 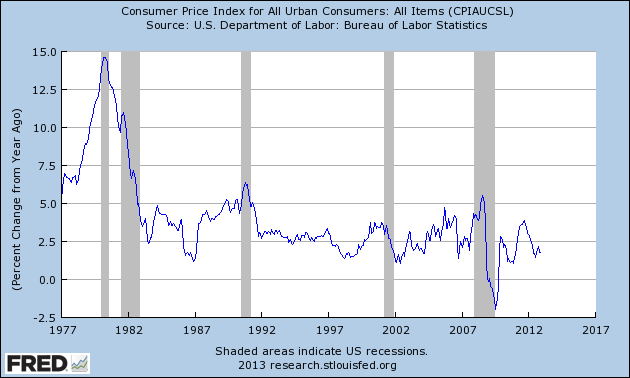 Although CPI inflation was low, there was rapid inflation in asset prices, such as houses. This rise in house meant banks and consumers were vulnerable to falling prices. When the correction started in 2006 in US (in 2007 in UK), many banks saw a significant fall in asset prices. Homeowners were left with negative equity leading to lower consumer spending. Banks highly geared. In the financial boom period, banks became more aggressive in lending. For example, in the UK, former building societies like Bradford & Bingley and Northern Rock, sought to pursue rapid growth. They increased their mortgage lending through borrowing on short-term money markets. They assumed that they would have continued easy access to credit at low interest rates. However, in 2007, when money markets ‘froze’ they were left with illiquid positions. The banks couldn’t borrow enough to meet their requirements and this caused a panic about bank finances. Risk not properly evaluated. The confidence of the great moderation caused many banks and credit rating agencies to become less circumspect about the riskiness of assets. Financial institutions across the world were buying US mortgage debt bundles, assuming they were a solid investment. However, the reality is that these investments were based on shaky foundations, and when the US housing market fell, banks were left with significant losses. 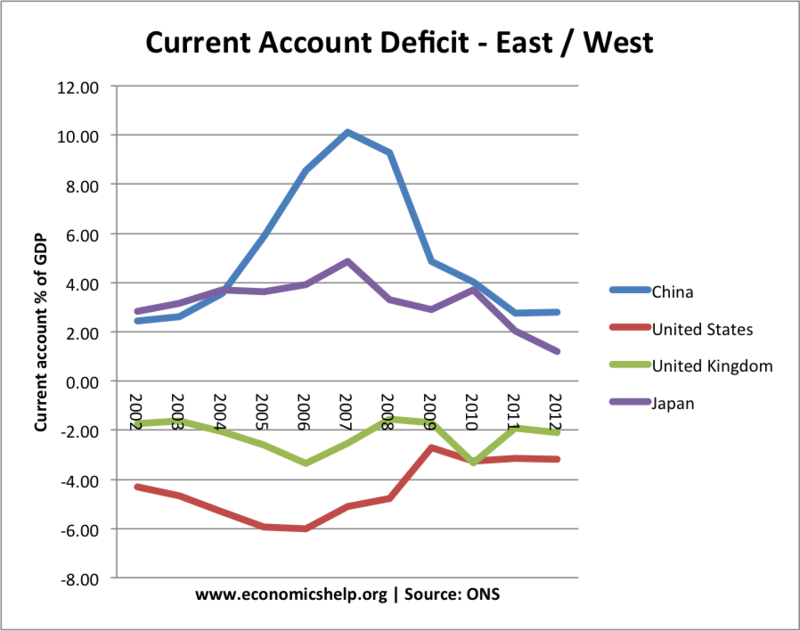 Another reason countries like the UK and US could enjoy high economic growth with low inflation was the growth of imports leading to large current account deficits. The US saw a current account deficit of nearly 6% of GDP at the height of the boom. This was financed by attracting capital flows from other countries, such as China. However, it was indicative of the fact the economy was unbalanced. The growth was based on consumer spending and not investment. See: Global trade imbalances Within the Euro, there was also a growing trade imbalance between northern and southern Europe. In the fixed exchange rate of the Euro, southern Europe was becoming uncompetitive, leading to lower demand. This would cause problems. See: Problems of Euro. Interest rates artificially low. Arguably interest rates were artificially low. Hot money flows into the US caused interest rates to be low boosting growth and investment. The low interest rates also encouraged banks to seek more profitable risky investments with higher interest rates. In the Eurozone, countries like Greece benefited from low interest rates on government bonds; this discouraged Greece from tackling their budget deficit. When markets became more willing to scrutinise risk, they realised they had underestimated the prospects of Greek default. The great moderation saw a fall in the savings ratio, and growth in private debt. Economic growth was partly being financed by higher debt levels from both banks and consumers. 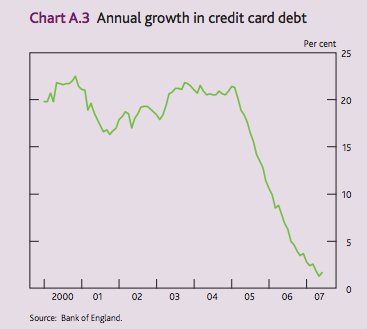 For example, the great moderation saw a very rapid growth in credit card debt. This meant that when sentiment changed, banks and consumers felt the need to improve their balances sheets. This explains the prolonged weakness of aggregate demand. We are in a balance sheet recession – with banks and consumers trying hard to reduce debt through higher saving and lower spending. The growth in private debt meant it has been harder than usual to stimulate the economy. Interest rate cuts were ineffective because people didn’t want to spend and invest, even if interest rates were low. 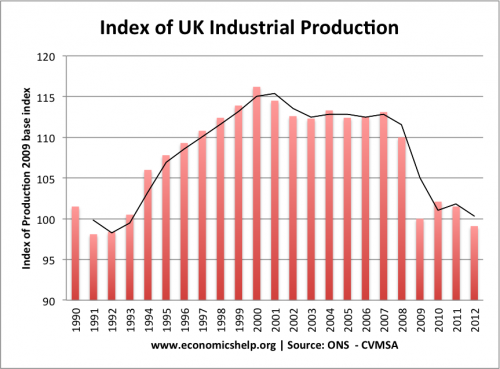 After 2000, the UK saw a decline in industrial production – even before the recession of 2008 onwards. But, there was strong growth from 1993 to 2000. This entry was posted in economics and tagged economic growth. Bookmark the permalink.